Situation: in the hamlet Sarigo, rural. Access/parking: access only for loading and unloading. public car park approx. 150 m.
Plot description: courtyard 50 m², reserved open space (roofed), (garden table, 2 chairs, benches). Center Castelveccana in approx. 2 km. Varese in approx. 30 km. Lugano in approx. 34 km. Next shopping possibility (Castelveccana) in approx. 2 km. Next supermarket (Porto Valtravaglia) in approx. 3 km. Train station Porto Valtravaglia in approx. 3 km. Airport Milano/Malpensa in approx. 52 km. Harbour/marina Castelveccana: Caldé in approx. 2.5 km. Lake in approx. 3 km. Pebble beach in approx. 3 km (Castelveccana: Caldé). Indoor public swimming pool in approx. 10 km (Luino). Golf course Golf Club Varese (Luvinate), Golf Club dei Laghi (Monate), Golf Club Lugano (Caslano) (18-hole golf course) in approx. 23 km - 26 km. semi-detached house, 2 - 6 people, 3 room/s, 2 bedroom/s, 2 bathroom/s, approx. 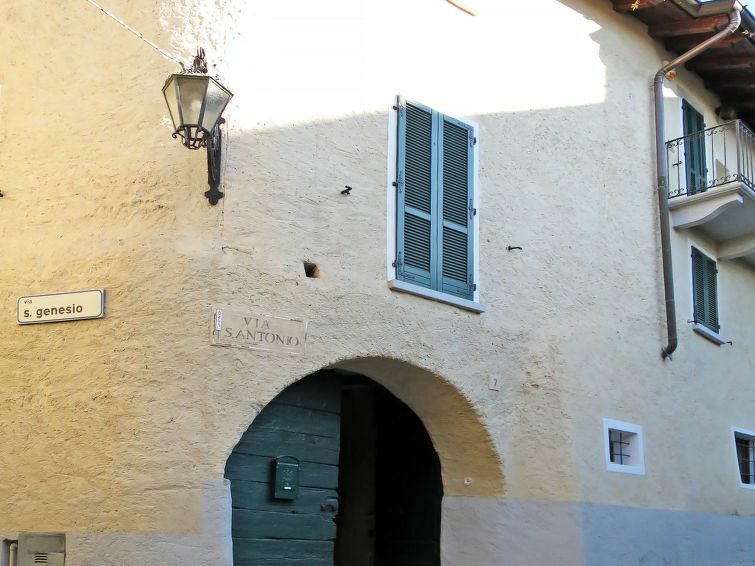 60 m², 3 floor/s, 16. century, restored 2014, separate access to the property. Please note: No internal connecting door between the floors. Owner lives in the house. Furnishing: rustic, tasteful, with some antique furnishings, cotto floor, wooden floor. Living room/bed room(floor 1): double sofa bed, fireplace (open). From the living room ladder to the gallery with sleeping facilities, see bedroom n° 1. Living room/bed room 2(floor 2): 2 x armchair, double sofa bed, wood stove. Kitchen: separate (ground floor). Kitchen/ cooking equipment: 4 gas rings, oven, microwave oven, dish-washer, combination fridge-freezer, coffee machine, toaster. Sleeping accommodation 1(floor 1, roof pitch, limited height): mattress on the floor (1.60 m wide) at the gallery to the living room. Additional information: low positioned window. Bedroom 2(floor 2, roof pitch): queen-size bed (1.60 m wide). Important information: maximum occupancy 6 people. During the summer months, the apartment on the top floor with access via the patio (roofed) is used by the landlady. Local service charges € 15 per person and stay (depending on occupancy). Firewood if required. Heating if required, € 5/​day. Linen/towels Bed linen available. Towels must be brought along. Towels available on loan, € 5 per person/​change (on order). Deposit € 150 (in cash). Cot/​High chair free of charge (on order). Pet 1 pet allowed, € 20 per stay (please advise prior to arrival; additional animals on request only).